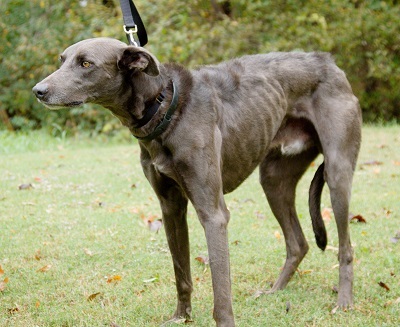 Sundance is a blue greyhound/wolfhound mix found in Tulia as a stray. He is approximately 3 to 4 years old. This big boy will be ready to dance into your home soon! We do not yet know if Sundance can live with cats or small dogs. Please click here to view Sundance's DNA report. Sundance is an imposing figure - a big burly blue boy with intense eyes and the biggest head...and the kindest, gentlest soul of a hound! Good things come in large fuzzy packages! He loves toys that squeak and toys that roll, he takes them from one room to another to keep them near. He's also a voracious eater and wolfs down his food, even in a slow down bowl. On nice days he dines al fresca so he can take care of business while the rest of the pack eats a leisurely meal. During inclement weather he eats in his crate and has to wait until everydoggy else is finished. Sundance/Sunny is 1st in line for a treat and will take two if anyone else is too slow. We're still working on counter surfing - multiple plastic cups line the counter designed to fall and startle him...always an opportunist, he's a bit stealth and tries to maneuver around the obstacles. Sundance needs a pack and if one is away for the day, he'll moan and cry for a while. 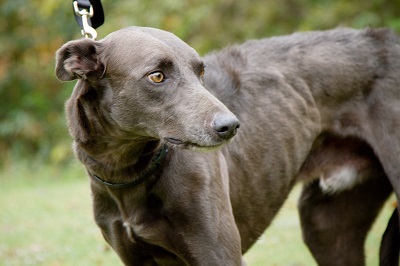 He would adore a yard where he can run and play with other dogs interested in a fun romp. He does fine in our small area and bounds across the yard with a joyful hop, skip and twirl when it's cool outside. Sunny needs a companion especially when on a walk. He will literally stick to his human like glue if he is out by himself - it's rather hilarious and a lot of trouble to walk a straight line with nearly 90 lbs of dog stuck to your knee. With another dog or two he does much better and has an enjoyable time (so will you). Sunny is a sweet congenial companion, content to curl up on a dog bed, in an open crate or on an empty couch.